The 2020 Ford Super Duty has debuted with updated looks, a pair of new engines, a 10-speed automatic transmission and more. Joining the new gas engines is the third-generation 6.7-liter Power Stroke diesel V8. Again, no power and torque figures have been released, with Ford simply saying the engine has been “upgraded” to deliver more maximum output. Improvements made to the engine for 2020 include a new 36,000-psi fuel injection system with new injectors, a redesigned turbocharger, new pistons and structural enhancements for the block, cylinder head and connecting rods. The new 10-speed TorqShift automatic transmission is available across the range, with the six-speed automatic serving as the base transmission. Ford says the 10-speed “features a wider gear ratio span than the 6-speed and is designed for the harshest towing conditions.” The 10-speed also has selectable drive modes with normal, tow/haul, eco, slippery, and deep sand and snow modes. 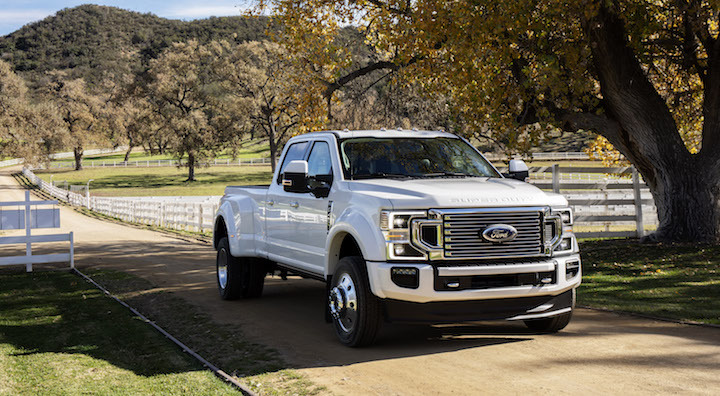 The 2020 Ford Super Duty’s restyled front end isn’t just for show – the automaker says it improves cooling, while the redesigned headlights also have better lighting performance. Additionally, dual-rear-wheel Super Duty trucks get a high-airflow grille for additional cooling when towing. All versions of the truck get a redesigned tailgate, new tail lamps and a different rear bumper as well. Inside, the F-Series Super Duty remains mostly the same, but gets some small changes in the way of new available leather upholstery and new wood and aluminum trim, along with an optional Miko suede headliner. Some new technology is also on the table including the standard FordPass Connect embedded 4G LTE wi-fi modem and the optional Pro Trailer Backup Assist system. Active safety tech is also offered in the way of lane-keeping alert, a blind spot information system and pre-collision assist with automatic emergency braking. Ford says these safety features will be standard on XLT and above Super Duty models. Look for the 2020 Ford Super Duty line of trucks to go on sale later this year. 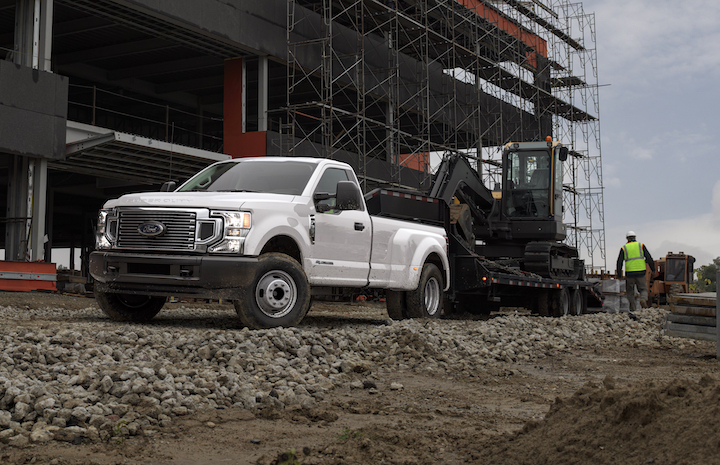 More information, such as performance and towing figures and pricing, should become available at a later date, so stay tuned to Ford Authority for more Ford F-Series Super Duty news. Looking forward to all these new upgrades & the New 7.3 V8. Just hope to god it’s NOT a push-rod OHV 2 valve engine. Ford keep the 7.3 in the 21 century with a DOHC 4 valve & don’t resort back to the 1950’s like GM/Chev do/have. It’s a pushrod motor. It’s hard to make a large displacement OHC engine for packaging reasons. The engine ends up being too tall and wide. Ford guys I work with are excited for the pushrod 7.3. They’ll buy this, also if it ends up in a conversion van. It may even win over GM buyers that are put off by their recent design changes and not offering an equivalent engine/trans.